Fond of Snape » Blog Archive » OW! SHITE! DAMN! Reflect on the characteristics of your best friend. What makes him or her so special? Great question, Lisa! Intelligence…determination…perseverance! Aren’t we always attracted to those qualities we lack? What is one quality you admire most in others? Self esteem! See second sentence in question #1. Describe an activity that you think is truly romantic. Walking hand in hand, an unexpectedly kiss, not being able to stay apart for any significant length of time. I call it Squirrel and Sunflower, cause I’m unimaginative like that LMAO! Got my stitches out today and it hurt like a MFer!!! I was swearing my head off, and I seriously wanted to PUNCH someone. That shite hurt more than ANYTHING else in this whole cancer adventure. DAMN!!! I agree with your second sentence of #1. Sorry you had such discomfort getting the stitches removed. Hope you’re sitting comfortably soon. Yuck on the stitches Hope you’re feeling better! I love the squirrel pic! What a great shot–you really needed timing to capture that. Sorry about the pain, but glad it’s over. So sorry to hear about the stitches! Boo. Can I punch someone for you? I really want to help you out like that because I feel that I could do a very good job with that today. Ow about the stitches. I guess they were happy with your healing progress, eh? I’m so sorry! Why didn’t you call? I’m feeling pain just reading about your de-stitching. Didn’t they numb it first!?! And your squirrel pic is INCREDIBLE!! Great bokeh and your subject is so real I can almost reach out and touch it! How about calling it Seed Shaker? Nah – that’s lame. I’m not getting any creative ideas for your photo. Which is so deserving of it. Now go find yourself some zombie destruction video game to play and take out all your punchy anger on something fun. Do they make video games where you try to kill the cancer cells? That would be super cool. Love the pic, I can see why it was “explored” on Flickr!!! very cool! I’m so sorry you had to go thru that with the stitches…I think I would have insisted on drugs, major drugs at that! LOL Sending you hugs and hoping you are doing better today! I’m so sorry the stitches removal hurt so much. If anything that part should be pain free. Definitely not fair!!! Love that picture!!! No need for an imaginative name, it speaks for itself. Great photo! I had the tape instead of stitches, so had the pleasure of taking them off myself. Sorry that you had to have actual stitches and they hurt coming out. 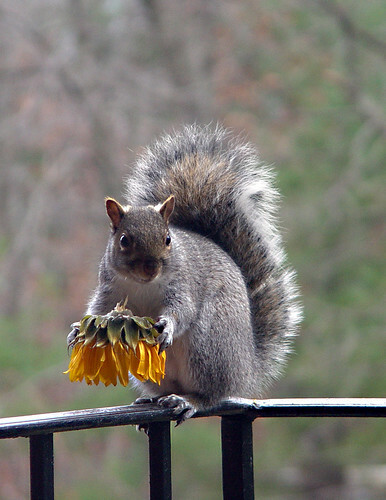 Love, love, love the squirrel and the contrast of the bright yellow sunflower. You just get better and better! I’m sorry you are suffering. I hope the pain eases soon. That is a great pic, creative title or not. Isn’t is strange that the damn stitches hurt more than the entire surgery thing? I’ve always thought they could figure something else out for that.